I’m currently finishing up my next to last class for the school year — Principles of Artisan Bread Baking. It’s the first year class that I had been waiting for all year, and while it’s been fun and thoroughly educational, it’s also so well within my comfort zone that I haven’t felt terribly challenged. Perhaps it’s a mental thing — I’m simply not petrified of failing in this class. 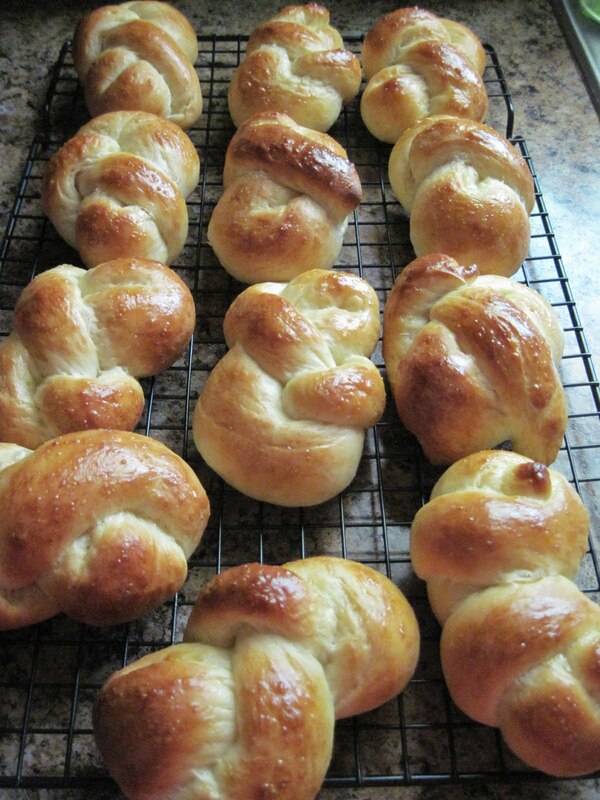 However, there’s one thing that has me completely stymied: “braiding” dinner rolls. I put that in quotations because it’s not really a braid — it’s made from a single strand of dough — but it’s twisted to look like a braid. I’ve been over it many times and had Chef and more adept classmates show me the technique again and again and I’m confident I’m doing it the same way they are…. it’s just that the final product doesn’t look quite right to me. My practical is this Sunday and I know the dinner rolls are one of the products I will be graded on. I have to make a total of three shapes — the braid, a twist and a dog bone (sort of like a double twist). I’m not concerned about the last two. I made rolls today and practiced the braid. About halfway through the dough I think I may have had a breakthrough but then again, I’m not sure. We’ll see on Sunday. I can spot many nice braids and also at least one dog bone. You have very good eyes!! I made one dog bone just to be sure I remembered how, but concentrated on the braids. Fingers crossed for tomorrow!